In part three of my many part series about 9% of the words of the second sub-part of the second sub-part of rule 608, I confirmed that in 14 out of 977 cards beginning with A we might find ourselves wishing for the words "if you do" in the even that spells with no targets were not longer countered. That's not a whole lot of "if you do"'s. I'm not even suggesting they be added, since I don't think there is a great reason to add that text in any of the cases. There are plenty of cards that are difficult to understand if one of their targets goes missing. If both targets are present and targetable when Retribution resolves, the opponent chooses which is sacrificed and which gets a -1/-1 counter. But if one target is missing, the remaining one must be sacrificed. It can be regarded as purely an accident that it works this way and not the other way. But what I looked at today is the number of cards that Gatherer lists a ruling that reminds players about spells being countered if they have no targets. I looked at the most recent set, Aether Revolt, with it's 197 cards. The rule is mentioned in the rulings for 11 of the cards. That's not a lot, but it's a lot more than 14 out of 977. If an artifact becomes an illegal target for Release the Gremlins, it won’t change the number of tokens created. However, if every target artifact becomes an illegal target, Release the Gremlins is countered and no tokens are created. This is pretty seriously unintuitive. If the gremlins are only willing to show up if there are artifacts to munch on, then why would reducing the number of artifacts by half not reduce the gremlins? But if the gremlins are showing up anyway and destroying as many artifacts as they can get their hands on, why wouldn't they still arrive if all the artifacts went missing. This is similar to the Ashes to Ashes issue, but on a much larger scale. It's very hard for me to think this rule doesn't result in a lot of mistakes, a lot of "What? "s and a lot of "Why? "s at lower level play. Baral's Expertise let's you cast a free spell if there are no creatures to return, but only if there were also no creatures you wanted to return at the time of casting. This isn't a problem with old cards from the Dark and Legends, this is a problem for new players today. I've seen top-level players make mistakes surrounding this rule and more times than that I've seen players utilize this rule and have professional colour commentary staff become momentarily confused. And then we have cards that appear to have been worded specifically to avoid being countered for lack of target. One could easily argue a flavour reason for Dark Salvation targeting a player - it represents Liliana helping the gatewatch fight Emrakul, so it's appealing that it can summon zombies on behalf of another. I have to suspect, though, that part of the reason why the card targets a player is that it will still create the zombies if your opponent sacrifices their creature in response. If there is no one to rip to pieces, presumably that wouldn't become an issue until after you'd finished the zombie summoning bit. The card even targets "up to one" creature - you can do the summon zombies part without even sending them off to attack anyone. The idea that the necromancy is dependent on what is done with the zombies post-animation is completely out of flavour for the card. The fact that you can't raise zombies with Dark Salvation if your opponent has Donated a Runed Halo to you but you can still raise them with From Under the Floorboards is odd, but probably the lesser of two wrongs. Which gets me to the big problem countering spells whose targets have gone missing. It restricts design space but doesn't appear to open up any design space. In my review of targeting cards I couldn't find a single card that would behave in an unintuitive way without that rule that couldn't be fixed with a few words in the text box. I found quite a few cards that behaved in uninituitive ways because the rule exists and there just isn't a way to fix it. Going back to Adverse Conditions. Suppose the design team really meant for you to get the Eldrazi token regardless of whether the creatures were still there to tap, what could they have written on the card? Other than the words, "This spell cannot be countered by rule 608.2b" there really isn't anything. No matter what you wrote on the card, it wouldn't happen until the spell resolved and the spell would never resolved. 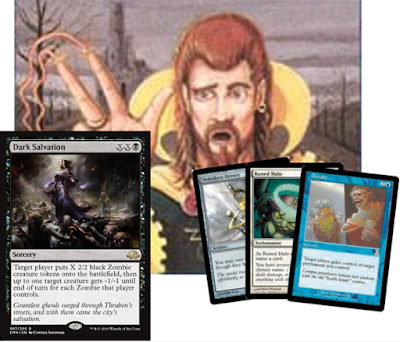 They could have made creating Eldrazi scions a trigger on casting the spell instead of part of the spell's resolution, but that would have been incredibly awkward unless they did it to every spell that created those tokens, and it would actually change the way the card worked in games. What does that leave us, targeting the player as well like Dark Salvation does? We can approximate the effect of creating the token if the spell has no targets left, but we can't actually do it. I will continue my hunt for a card that has an effect that is genuinely enabled by the countering clause of 608.2b, but I don't think I'll find any. In the meantime, I expect to find plenty more cards that are limited by it.